I repurposed a ceiling medallion and made my own DIY Beaded Sunburst Mirror! This is such a beautiful home decor and gift idea! 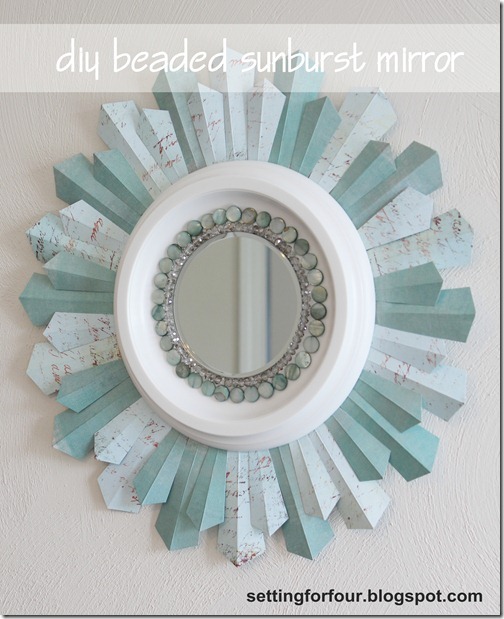 Learn how to make this gorgeous DIY Sunburst Mirror using a ceiling medallion and beads! 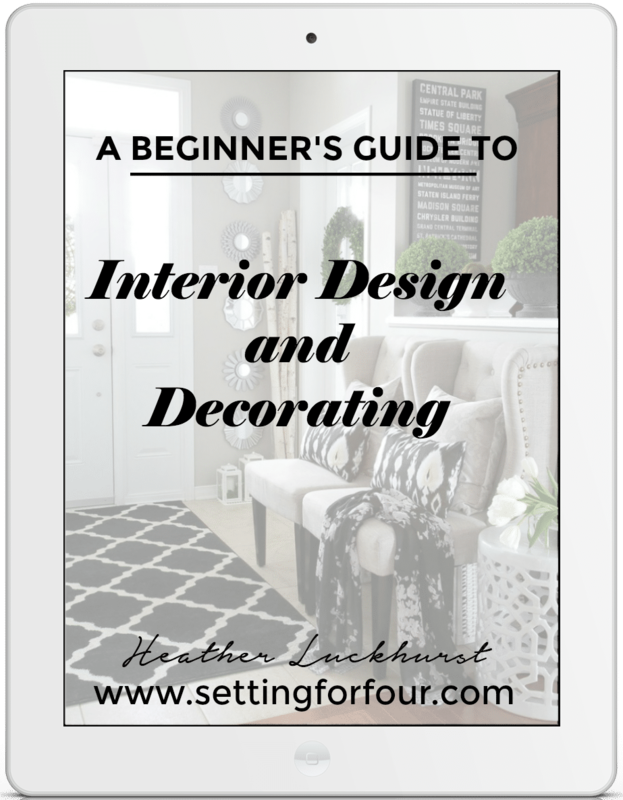 Includes a step by step tutorial with all instructions and supply list. Perk up a wall in any room with this bead and paper craft idea. Customize it with other colors too! If you like coastal decor make one in the blue and soft gray colors that I used. You can also use different color beads and paper to completely customize it! I am totally in love with it! Amazing, amazing, amazing!!! This is gorgeous, Heather and such a unique take on all the sunburst tutorials I saw last year. How long do you think it took you to make this? 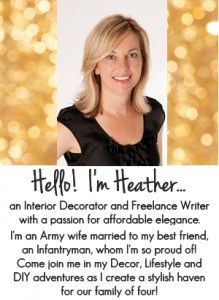 Heather – that mirror is stunning! 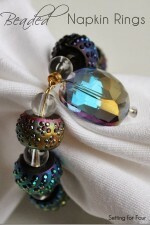 I love the colors you chose and the beads really make it pop! I was SO over sunburst mirrors till I saw yours! This is gorgeous, Heather!!! Was the Medallion very $$$? Oh my! This is gorgeous! I love the color palette!!!!! Nice job!! loved this easy diy project! Flawless execution, as usual. Beautiful mirror! I see some features in your very near future. Glad to see your hand make an appearance in yet another post. Good job with your sunburst mirror. I know they are all rage, and I just can’t help loving them too. Stopping by from Between Naps on the Porch. Amazing craft! I love how you can customize this to your color scheme so easily. Hope you’ll stop by my blog, I’m you’re newest follower! That is gorgeous!! Saw it over at Coastal Charm. This is one of the prettiest sunburst mirrors I have ever seen. Thanks for the great tutorial as well, I actually think I could make one because you explained it so well! Another post I will be bookmarking to make! This turned out amazing! I adore the bead detail you did around the mirror. So very thought out. Yay for new blog friends! This is so pretty, you did a great job! Very pretty! I like using media for things other than what they were intended. Really clever idea! Visiting from 36th. This is simply beautiful. The use of the scrap paper is ingenious! At first glance I thought it was metal. Too cool. Thanks for sharing. That mirror is too fabulous! Using the scrapbook paper makes the possibilities endless. This was a great tutorial. Hi, I’m visiting from Amanda’s link party. This mirror is stunning! I love the colors & it seems so simple to make too. 🙂 Thanks for sharing! Heather that is GORGEOUS!!!! I love the look! Where in your home are you using it?? This may be a fun Sunday project for me soon! this is FABULOUS!!! Great work- I never would have guessed that was just scrapbook paper. It looks just wonderful! 🙂 Great Great GREAT job!! I am so in love with this. I will try it! Thanks for sharing this with us this week at the Sunday Round Up Link Party. Wow, love your creativity! Thank you for sharing. Great job! This is so beautiful! It looks like it would costs a fortune! Very chic! Absolutely gorgeous! I have pinned it, I want to make one for our home. This is so fun! I love your creativity. Thanks for linking up. So creative and so cute! I am a new follwer and found you through Whatever goes Wednesday link up party. 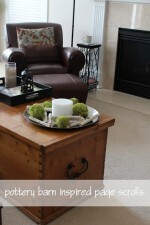 I blog over at http://www.garagesalesrus.blogspot.com/ Check us out when you get a chance! This is AMAZING!!!!!! I just adore it!!! Fabulous! This is awesome, So pretty! Thanks for linking up. Brilliant! I may just have to recreate this and of course give you all the credit! I didn’t even remotely anticipate that you had used PAPER for the rays… how simple is that!? Love this! Love this~ I am featuring this tomorrow! Thanks for linkin up! That looks awesome! I thought the paper was metal! What a great idea. Love it! This is fantastic! I love all the details! How pretty! Love the fresh colors you chose and the little sparkles! Awesome job with the mirror! This is so chic looking! Thanks so much for sharing this project at Naptime Delights! I hope to see you again tomorrow! You’re welcome Joanne! Your version looks fantastic – great job! It is such a compliment that you tried this tute! I love your mirror. I have been planning a medallion mirror for a while. (I need a clone to get everything done.) I love the paper sunburst–so pretty. I am featuring you at Its So Very Cheri on July 12th. 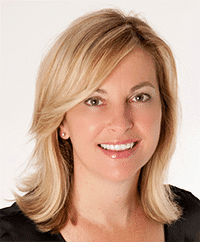 Cheri – I need a clone too!! If you find how to get one let me know 🙂 Thanks for your compliments girlfriend! I am so copying this! Love, love, love, love, love this! Thanks Amy for your sweet coments! I would love to see how your version turns out! Send me a pic of yours when you are finished and I will post it on facebook! So glad you like it – I am really enjoying mine! I like the way you used your Photobucket slideshow under your header. Visiting from Homemaker on a Dime via Adorned From Above. Have a nice Sunday! This mirror is gorgeous! When I first saw it I thought the rays were galvanized metal, but they are paper! That sounds a whole lot easier! Wow…wow…incredible! 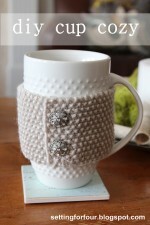 I love this and am pinning!! Gorgeous!! I love this!! Pinned & shared!! WOW that is so pretty Heather! I love the color too. Loving this mirror, want to try one for myself. Thanks for the instructions. I love this one! It’s so pretty and interesting to look at! Heather your mirror turned out gorgeous! Saw this on pinterest. I agree with the others-not been a huge fan of sunburst mirrors, but yours turned out so beautiful! Well done! I just might need to make one of these now! Thank you so much for sharing this. I love, love, love it! I just made one for my son and his girlfriend. I appreciated your detailed instructions and materials list. My beads and papers are different, but in the same gorgeous teal colors. What an awesome Christmas present. Thanks again for sharing your creative genius! Thanks so much for your lovely compliments! I’m so glad you made one for a Christmas present!! I’m sure your son and girlfriend will love it! This is SO beautiful! Thanks for the tutorial – I can’t wait to try it! I’m glad you like it and have fun making your own!! Heather, Totally enchanted with this. I’m considering doing this using Mod Podge on the scrapbook to give it some protection. What do you think? Things tend to get really dusty in my house because I leave windows and doors open as weather permits. I’m going to add my comment to the million others you have – this is INCREDIBLE! Thank you so much for sharing! I thought the paper was metal and never thought I could do something like this! This is TOTALLY going on my list to make soon! Thanks for the AMAZING inspiration! I’m glad you like my DIY Mirror Brooklyn!! Thanks for leaving such sweet comments! Gorgeous! What a stunning piece to put in your home. I love it! Thanks so much for featuring my mirror Amanda! That’s so exciting that your readers liked it!! I was inspired by your idea here to create a starburst mirror of my own and wanted to give credit where credit is due. Mine will end up looking nothing like your classy version and its still in the preliminary stages but when I posted my pics to my Facebook page, I included the link to yours. I’ll be sure to do the same when I post my finished project to my own blog. Thank you for taking the time to write this tutorial and sharing it with us. Oh I can’t wait to see your version!!! Please email me when it’s finished! I think just about everyone has done a starburst mirror but not as well as you! Beautiful colors and embellishments. I’m about to tackle one of my own. Thank you for the great inspiration. Oh great Gloria! Have fun making it! Mary Ellen – you could use blue colors or sandy metallic colors if you’d like a coastal look! I love the colors and want to make one for myself, only a little bigger and sturdier. I’m wondering why do you unstring the crystals then restring them on the same elastic string? Hi Karen – because I used the crystals from 2 bracelets and strung them onto one elastic string – hope that helps!! Thanks for visiting!